Bella da Semana - Put your socks to show! Put your socks to show! Socks have suddenly gained such an important status in the male closet, that we cannot deny their aesthetic contribution upon the choosing of a look. It’s something like picking the socks before anything else. The great proof of the distinction as a trend is the amount of stores and brands worried about bringing more design and significance to window shopping. A tempting offer! We went through a long sock-less phase. The trend back then was wearing socks as hidden as possible, as if they didn’t even exist. But, hey! Things have changed now, as well as the current fashion context, and the pair became essential when it comes to making a difference on the way you dress yourself. The trend started due to the arrival of the shorter, tapered trousers - many of which leave the ankles bare. Shall we start talking about the raw material for socks? Their composition may take natural fiber, usually cotton, synthetic or mixed fiber. The transpiration must be considered while picking the best pair, since bad feet smell can be related to several factors, including the type of fabric you wear to cover them. Cotton socks usually allow better breathing of the feet, contrary to the synthetic ones, that tend to hold the sweat in. If you’re after a sober look, think about socks with little details or patterns. 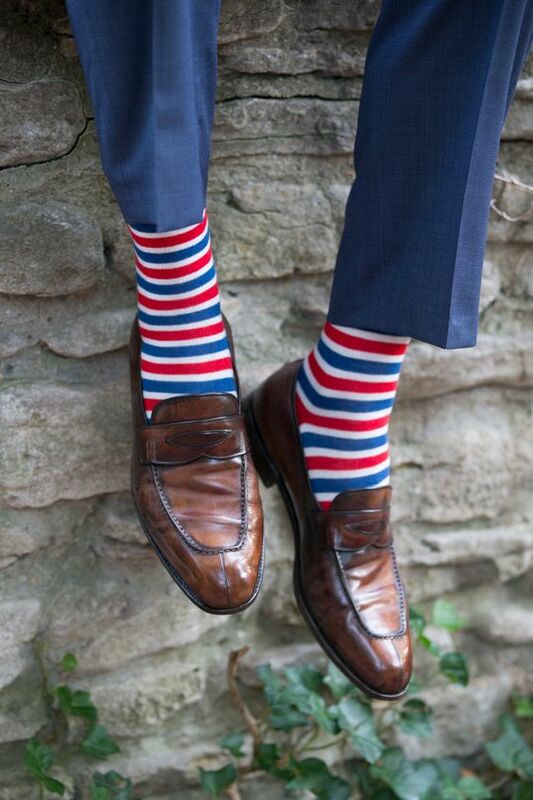 Combine the color of your trousers with the background shade of the socks, highlighting only the discrete patterns. Polka-dots and stripes are good options to ensure a differentiated visual, without daring too much. Neutral, basic colors such as black, grey, and beige are the best ones if you want to start little by little. Now, if you’re going for a more striking style, go for strong shades and patterns. Larger shapes and drawings, multi-colored prints, color contrasts and a mixture of vibrant and neutral colors are good examples. The idea is to make your socks the protagonists! But it doesn’t mean that you need to pick patterns and prints. You can also play with monochromatic pairs, creating a smart contrast between trousers and shoes. Stronger shades, such as yellow, turquoise and green go well with more neutral pieces of clothing, like beige, grey, and white. The only rule is to wear special socks if you’re wearing formal shoes. Never ever wear sports socks with formal shoes. Also, make sure the heel piece is always into the right spot so the appearance is harmonic.